Covering almost 150km of the Bibbulmun Track from Walpole to Albany and showcasing the incredible biodiversity of this unique region, this trip is considered a must-do by many seasoned walkers around the world. Towering forests of Karri, Tingle, Jarrah and Marri trees, mist-shrouded valleys, giant granite boulders, peaceful coastal heath land and idyllic coves are just some of the astonishing natural wonders to explore here. We’ve designed the walk to avoid a lot of beach walking in favour of cliff top tracks with many elevated vantage points like Monkey Rock for stunning panoramic views. Conspicuous Cliffs, Peaceful Bay, Lowlands Beach and Cosy Corner are some of the evocatively named highlights that await. This is a truly pristine wilderness, combining majestic coastal scenery and unique flora and fauna, in an environment that has been protected by vast distances and minimal human impact over millennia. Stunning wildflowers year-round provide a vivid contrast to the azure ocean views and the whitest of sandy beaches, and the range of subtle and rugged textures of bush, trees and forests make this an unforgettable experience for the senses. A real favourite for those who like to take the road less travelled. While walking the Bibbulmun Track you will have the support of our team on the ground along the way. You can fully experience this amazing walk with the freedom of knowing that at the end of each day there’ll be the luxury of having a hot shower, a chef-prepared dinner and a good night’s sleep in a comfortable bed. Rising refreshed and primed for next day’s fabulous walk. Start in Walpole any time after 2pm. This is about 420km south of Perth. Coach services operate daily. The Bibbulmun track is named after the earliest indigenous inhabitants of Australia’s south west. 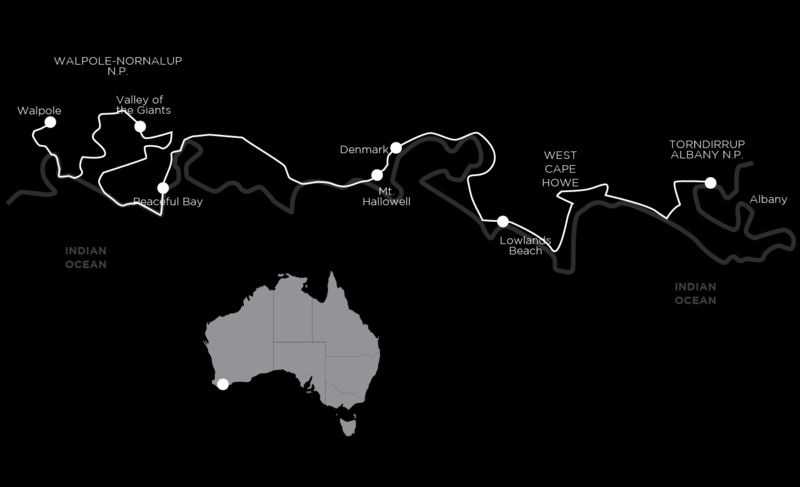 The track is Australia’s longest walking trail at a distance of over 1000 kilometres. Begin walking the Bibbulmun Track from your accommodation in Walpole and head along the edge of Coalmine Beach at Nornalup Inlet. Groves of peppermint trees give way to the first of the magnificent karri forests as you climb to Hill Top Lookout. From here there are expansive views back over the inlet at the mouth of the Frankland River. The next highlight is the Giant Tingle Tree, a massive buttressed Eucalyptus tree with a hollowed out base. This is one of the unique plants found in this area. Did you know that 75% of the south west’s 7000 species of flowering plants are found nowhere else on earth except here? It’s easy walking as the Bibbulmun slowly descends to the banks of the Frankland River. Transfer back to Walpole for the night. Back at the Frankland River, continue walking through Jarrah and Marri forest to the Tree Tops Walk, a 600m loop walk along a raised boardwalk, reaching a height of 40m above the ground. The optional Tree Tops Walk near the Frankland River affords an additional opportunity for a birds-eye view of the forest via a raised canopy boardwalk at tree level. Walk amongst Tingle trees at the Ancient Empire Walk that are large enough to park a car in. The Bibbulmun continues downhill through more beautiful karri forest to your accommodation. Head off from your accommodation through a forest of rare red flowering gums before the gentle descent to the coast at picturesque Conspicuous Cliffs. The track picks its way along the spectacular cliff tops, passing many superb whale-watching lookouts. Today’s destination is the laid-back beach settlement of Peaceful Bay, home to about sixty lucky locals and a whole lot of tourists during the holiday season. Transfer back to your accommodation. After a short transfer to William Bay, continue along the spectacular cliff top track passing huge granite tors. There’s time for a swim at Lake Williams before continuing to Lights Beach, one of our all-time favourites. The Bibbulmun heads inland for a long stretch, climbing to a high vantage point at Monkey Rock. From here you have expansive views over Wilson Inlet at Denmark. Then it’s onwards and upwards to the highest point on this holiday – the summit of Mt Hallowell with more karri forests and a jumble of granite tors. Descend down the other side into Denmark. After a short transfer to the other side of the inlet at Denmark, the Bibbulmun continues across the Nullaki Peninsula where you’ll be able to see the Porongurups and on a clear day, the Stirling Ranges to the north-east. There’s more fabulously scenic cliff top walking before descending to Lowlands Beach, a favourite with the locals who erect a shade shelter here during the summer months. On a calm day, it’s a great place for a swim before the final short walk to your accommodation for the next two nights. After a short transfer to Cosy Corner, walk back to your accommodation near Cape Howe. This is one of the most scenic coastal sections with the black dolerite cliffs of Cape Howe contrasting with the azure blue seas and pure white sands of these seldom visited beaches. Sections of walking across granite slabs add a different feel to the track. Another short transfer to Mutton Point before arriving at your accommodation in Albany and the end of the Bibbulmun Track. Today features more cliff top tracks with the added element of getting up close to a large wind farm. Here, they’re laid-back enough to allow walkers to get close enough to touch a turbine. This wind farm also happens to be at one of the most scenic sections of track, causing some to object, but remember that it provides clean renewable energy for the town. The route continues through a section of the Torndirrup National Park before descending to Frenchman Bay and Princess Royal Harbour in Albany, the foundation site of European settlement in WA. Walking the Bibbulmun Track is a real achievement and there is no better place to celebrate than in remote iconic town of Albany. This holiday finishes in Albany after breakfast. Your accommodation hosts will be happy to drive you to the coach stop for public transport connections or back to your vehicle. The track is generally well graded and relatively easy to negotiate. Full days walks average about 21km. There are great opportunities for fit walkers to challenge themselves on at least three of the days with walks up 26km. The friendly locals we work with for accommodation, meals and transfers are attentive to your itinerary and eager to help make your departure and arrival each day as smooth as possible. The accommodation each night is in B&Bs, motels and some remote cottages in inspired locations providing a welcoming and comfortable base to rest, relax and recount the day’s highlights. All rooms have their own ensuite. The two and three course dinners and cooked breakfasts are all generous, prepared by chefs where it is possible, with a focus on organic and regional food and wine. Each day whilst you’re walking you’ll be provided with a substantial Walkers Lunch and get to eat it at a fabulous location on the track. A Walkers Lunch is varied and may include a high protein type salad, roll or a wrap, muesli bar, cake or muffin and a piece of fruit. The walking is mainly flat well defined tracks. You will walk on average 20kms a day through diverse landscapes that only the Bibbulmun can offer. We provide a Bibbulmun Track map however you will find the comprehensive notes more than enough to easily find your way. This is a great opportunity for fit walkers to challenge themselves, however easier options are available on some days. This is a reasonably long and tough walk and we highly recommend that you incorporate a rest day. September to November is great for walking this track and there are lots of wildflowers about. Summer can be quite warm then it cools down by March. Autumn is also brilliant for walking in this area. This trip is available all year round, but in the winter months between June to August there can be prolonged wet spells making walking more challenging.